Now that I have a little more time I’ll give you all the full scoop on what I thought of the shops we visited on Sunday. This is more of a showroom than a shop. When you enter the space you’re greeted by textiles hanging from simple iron rods. The walls are made of a light maple. Cabinets on either side hold more samples, and simple wooden bowls display tiny balls of yarn. The feeling is very feng shui. Off to the right is the yarn room. Really, it’s more of a yarn corridor. At best it’s 3 feet wide and maybe 15 feet long. Along the entire left hand wall hangs hanks of yarn samples for you to fondle — mixtures of bamboo, silk, tencel, metal, wool, cotton, and nylon (to name a few). Along the bottom they have mini balls and cones of some yarns to purchase. Or, you can ask the woman in the back for a certain weight of yarn (3 ounces of this, 2 ounces of that) and she’ll wind it onto a small cone for you. The yarns are all very unique and interesting. Some can be rather pricey, but I assume it’s more expensive to create and spin such unusual combinations of fibers. I didn’t buy anything during my visit though, as I couldn’t find a fiber that I liked that I had a purpose for, and I didn’t want to just buy something for the sake of buying. Something to keep in mind — the lights made it VERY warm in the studio. It was a cool 75 degrees outside (with low humidity) but it had to be at least 85 in the studio. When we left the building and got outside again we all soaked up the cool air. 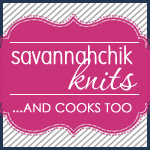 This is THE place to check out if you need a large quantity of good quality yarn. During my visit they had cones of cashmere/merino, merino, linen, silk, and cotton blends. Their stock changes quickly as they carry mill ends. But, to give you an example, the 70%merino 30% cashmere cones were 4 spi and approximately 750 yards to the pound. At 50 bucks a pound you could make a gorgeous sweater for $100. No, it’s not cheap, but for the quality it’s a very good price. Even though they’re mill ends the have WASHED samples of many of their cone products. 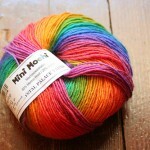 This is a huge help in choosing a fiber because the spinning oils have been washed away and the yarn has bloomed. The cashmere on the cone looks so limp and each ply is distinct. In the washed swatch it’s fluffy and super-soft. I have 2 cones in my stash of this stuff — one in a classic creamy white and another in a grey heather. In addition to their cone products they carry a full line of Karabella, a decent amount of Noro Kureyon and Silk Garden, and some Lamb’s Pride. They also have a table of hand-dyed sock weight yarns in wool, cotton, and some boucle. They’re dyed in small batches though so it’s hit or miss. A few in the group found some they liked. The quality of the wool was very nice. It had a tight spin that reminded me of Koigu. I know I’m going to go against popular opinion on this one, but the store just didn’t meet my expectations. They do carry many nice brands — Manos, Lopi (regular, not Lite), Koigu, Noro, and GGH for example. And they had a decent array of magazines including a few back issues of Rebecca. 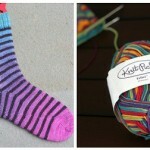 I think it’s the fact that most of the yarn is behind closed doors that disappoints me. I love walking into a store that’s lined with fiber so I can play with them, put them next to each other, and really daydream about how I’d put them to use. I’m sure that with space at such a premium in Manhattan it’s hard to have that sprawl of yarn. They did have a hank of each color of Manos, Koigu, and Lopi on display though. The amount of seating is nice though (they probably have 6 cafe tables with 2 or 3 seats a piece). After a decent amount of standing and walking we all appreciated being able to sit for a bit. We decided to eat lunch elsewhere though as the cafe only carried a couple of sandwiches and a few salads. Located in the East Village, Downtown yarns has a very cute space in an old storefront. Typical of many NYC establishments, the yarn is piled high on shelves that go up to the ceiling – at least 12 feet I’d guess. They had a nice variety of yarns and all were out on display. Lighting was a bit poor though and I kept bringing out skeins to get a good idea of the actual color. They carry a nice range of brands including Cascade, Brown Sheep, GGH, Blue Heron, Frogtree Alpaca, Joseph Galler (I love the Inca Cotton but still can’t think of a good use for it! ), Manos, Rowan, and Regia. I was disappointed though because their web site said they carried Alchemy yarns but all I could find was 3 hanks of powder blue silk purse. Toward the back on the left they have an old farm table for you to sit and knit or swatch. Pockets against the wall hold store copies of many books and magazines for you to reference or peruse. I’m so glad we went to this store! I had been there once before and I just wasn’t impressed. It was a hot and busy day in July and I was on the hunt for something very particular that time. I think it tainted my experience. A few of the yarn crawl girls had mentioned wanting to go, so I added it to the list at the last minute. While I don’t think any of the stores we visited that day were unfriendly, this store was ultra-friendly! Both women who worked there knew their knitting and were very helpful. It was the last store of the day (a very long day!) and so we all finally gravitated to sitting around the small narrow table in the middle of the store. Purl carries many brands you’d recognize and love — lots of Rowan and Koigu, Cascade, Manos, Noro, Habu, Lobster Pot, Harrisville, Elsebeth Lavold, Debbie Bliss, and Woolpak. I had never seen Woolpak in person. Their 10 ply comes in huge 430 yard hanks!! Given how much I enjoyed my Purl shopping experience, it should not come as a surprise to you that it’s the only store I bought yarn from. You’ve all been asking for pics and I promise I’ll post some tomorrow! 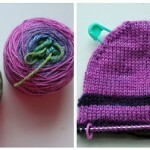 I’m so glad you made it to Purl, after you were hesitant to go back. It really is becoming my favorite store although Downtown Yarns is up there too. Great Commentary! You should write a book. When I checked out the websites I was disappointed that they didn’t show the colors that they had. I guess that since they get overruns it changes frequently. You think? A childhood friend whose mother just started taking up knitting again lives in Queens. I am going to send her to ur blog. Just an update — I think almost everyone on Monday night is working on some form of Poncho. LOL!! Oooh, you make me want to go back to NY. I haven’t been in years and wasn’t really a knitter the last time I was in the area. Look what I’ve been missing.